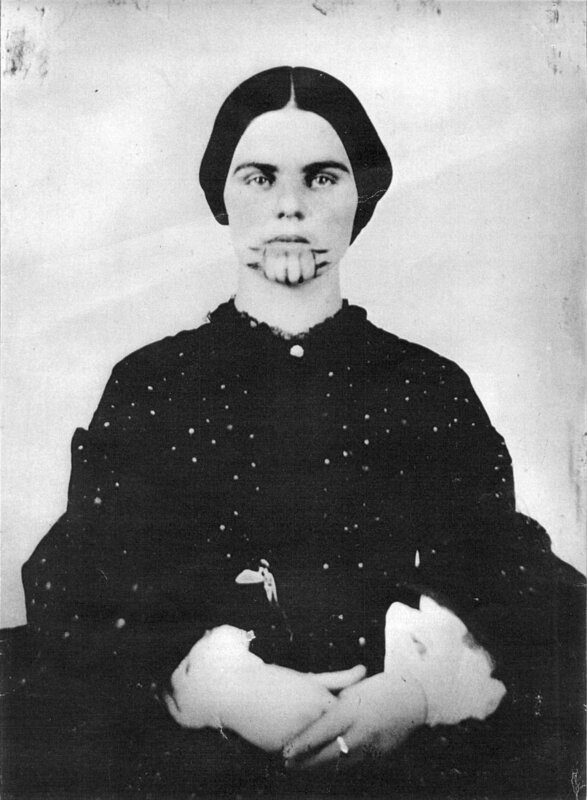 If tattooed Eva on “Hell on Wheels” seems to have stolen Olive Oatman’s chin tattoo, it’s because she’s based on her, as the HOW blog explains (with a quote from The Blue Tattoo). Eva’s Oatman has been tweaked: she’s a prostitute, which Oatman never was; she’s blunt and outspoken, which Oatman never was; and in 1865 when the show is unfolding, Oatman was a national celebrity, newly married to a wealthy Michigan cattle rancher and living in Texas during what she called the happiest period of her life. Eva’s the latest of more than a dozen tributes Oatman has inspired in art, film, theater, fiction, t.v. and music over the last 150 years, from Elmore Leonard’s “Tonto Woman” to Phantom of the Black Hills’ “Olive Oatman,” a song that, come to think of it, would work beautifully on Hell on Wheels. What’s AMC waiting for? This entry was posted on Monday, December 5th, 2011 at 5:34 am and is filed under Blog. You can follow any responses to this entry through the RSS 2.0 feed. Both comments and pings are currently closed.